"As excited as you may be, there are a few things to keep in mind once you're back out on the roads that will keep you and the group safe." Once winter retreats enough to thaw out the bike lanes in your neighborhood, hordes of people will take to the streets again to breath in the fresh air and feel the wind in their face. All of the fitness you gained while anchored to the trainer is more than ready to be showcased and what better way to test yourself than in a group ride? I'm sure I'm not the only one eager to reconnect with their cycling tribe - finally seeing them in person and getting a glimpse of what news jersey colors will fill the peloton. And as excited as you may be, there are a few things to keep in mind once you're back out on the roads that will keep you and the group safe. Below are some tips to ease this transition and keep you upright and rubber side down. Dial in your equipment. Tires pumped, chain lubed or waxed, screws tightened on your headset, water bottle cages bolted down, etc. Paying close attention to details and addressing any issues with your bike now, can save you an Uber call when you're stranded later. Some additional things to check: tires for tread wear, brake pads and maybe replacing your bar tape if it's in bad shape. Remember - a clean and well cared for bike is a happy and fast bike. Bike handling practice. Spend a little extra time dialing in some bike handling practice in your driveway before you take to the streets. Familiarize yourself with how your bike moves in tight, slow turns, and looking over your shoulder. Get up and out of the saddle to reacquaint yourself with how your bike moves without the restraint of a trainer. Remember: look where you want to go not what's directly in front of you and anticipate what's going to be in your path. If you want to accelerate your acclimation back into a pack, recruit some friends and do some bike bumping and wheel touching drills and even some emergency bike braking drills. These simple drills train your brain and body not to overreact when an accidental contact happens. You'll know how your bike reacts to different brushings and how to position your body in order to steer clear of any over reactions. Rules of the road. Staying to the right goes without saying and so is knowing the rules of the road and sticking to them. Every state in the US has different rules, as do other parts of the world. (For those stateside, check out this handy link by The League of American Bicyclists). Being predictable is just as important within a group as it is for other motorists. I'm also a big fan of rear blinky lights to give drivers a second pause that could save your life due to increased visibility. Group ride etiquette. Communication is key and pointing out hazards in the road is super important and helps avoid unnecessary crashes. The safest place to ride with others is either bar to bar or bar to hip. Protect your box (which extends the width of your handlebars to the tip of your front tire) and increase your odds of staying upright. Call out and point at upcoming turns, oncoming runners, potholes, and even passing cars to alert your fellow riders to potentially dangerous obstacles. Clothing. 90% of being fast is looking good, right? Get close fitting clothing that doesn't flap in the wind (loose jerseys = lost watts) tuck extra clothing tightly into pockets, etc. Bright clothing can help motorists see you. Awareness is key and saves lives! Have fun! A happy, relaxed mind is a steady and smooth one, especially in group settings. Loosen your jaw and use piano fingers on your bars if you're over gripping and tight. Position yourself on a side with an out - either towards the gutter or the opposite lane so if something were to happen, you'll have a little more wiggle room to work with. Jennifer Sharp, a USA Cycling Level 1 Coach, started racing in 2004 as a means to fulfill her competitive itch. Previously a national level boxer, she grew tired of getting hit in the head and decided to pound the pedals instead. She bought a pink Kona road bike completing several recreational rides and found herself passing as many people as possible. Since then she has multiple podiums at elite track national championships, master track national championship titles and world cup finishes under her belt. 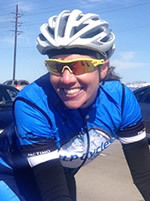 Jennifer, a Seattle native, joins the ALP Cycles Coaching with a background in road and track. Her experience as a USA ParaCycling team tandem pilot, part-time work at USA Cycling in the Coaching Education Department and love for all things cycling is a welcomed addition to the ALP Cycles Coaching team.